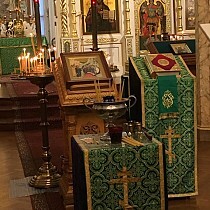 On Thursday, August 31, the feast of the Holy Martyrs Florus and Laurus and the Afterfeast of the Dormition of the Most Holy Theotokos, the First Hierarch of the Russian Church Abroad, His Eminence Hilarion, Metropolitan of Eastern America & New York, celebrated Divine Liturgy in St. Alexander Nevsky Diocesan Cathedral in Howell, NJ. His Eminence was co-served by Eastern American Diocesan vicar Bishop Nicholas of Manhattan, Archpriest Serge Lukianov (cathedral dean), Archpriest Mark Mancuso (dean of the Carolinas & Tennessee), Priest George Temidis (cleric of the Nativity of the Mother of God Church at the New Kursk Root Hermitage in Mahopac, NY), and Protodeacon Paul Drozdowski (cathedral cleric). 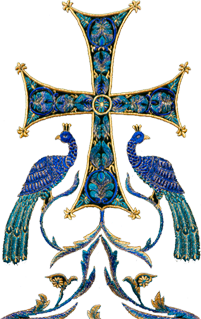 After the Augmented Litany and Great Entrance, the ever-memorable Metropolitan Laurus and Archimandrite Flor (Vanko) were commemorated on the occasion of their namesday, as well as Archimandrite Sergei (Romberg) on the occasion of the 25th anniversary of his repose, and Subdeacon Basil Anderson. Liturgy was sung by the daily cathedral male choir, under the direction of Alexandra Lukianov. Upon conclusion of the Liturgy, a procession was held to the Reunification Monument of Patriarch Alexey II and Metropolitan Laurus, where Metropolitan Hilarion led a Litia for the departed. His Eminence then presided over a regular session of the Diocesan Council, which was held in the cathedral library. Joining the above-mentioned priests at the Council meeting were Archpriest Victor Potapov (dean of Capital Region), Archpriest David Straut (rector of St. Elizabeth Church in Rocky Hill, NJ), Deacon Michael Wengrin (cleric of St. Basil’s Church in Simpson, PA), Reader Nicholas Pokrovsky (Our Lady of Kazan Church in Newark, NJ) and Reader Gregory Levitsky (diocesan treasurer). After the meeting, an outdoor luncheon was held in Nevsky Park, where Council members were joined by the pastor emeritus of the Diocesan Cathedral, Protopresbyter Valery Lukianov. During the luncheon, Fr. Valery congratulated the bishops and Council members with the feast and gave an informal talk about the history of the Diocesan Cathedral from its founding by Archbishop Vitaly (Maximenko) to the present day.